Last updated by Marcia Mayne at August 3, 2013 . It was faint at first then as I trained my ear, a rhythmic slap-slap-slap sound filled the spaces within the noise of the festival. Was someone chopping wood? Curious, I moved quickly towards the direction of the sound. That’s when I spotted her. Standing in front of a board that was hung about arms’ length above her head, she was wrapping a brown, sticky mixture around a nail that protruded some 6 inches from the board. Each time she folded the mixture over the nail, she slapped it against the board — that was the sound that had caught my attention. I inched closer and watched, fascination spreading over my face. What was she doing? The crowd around her stall grew larger as more people were drawn to her stall. Using smart phones and digital cameras, they recorded her movements as she stretched, slapped and wrapped the mixture for several more minutes. When she stopped, it had turned from brown to beige. A whiff of peppermint floated through the air as she added a few drops to the mixture and continued to stretch and fold until it glistened. Finally, she took it off the nail and added a few dollops of red that produced vibrant swirls as she stretched and twisted the mixture. Cutting off small pieces, she shaped them into canes and laid them on a small table. 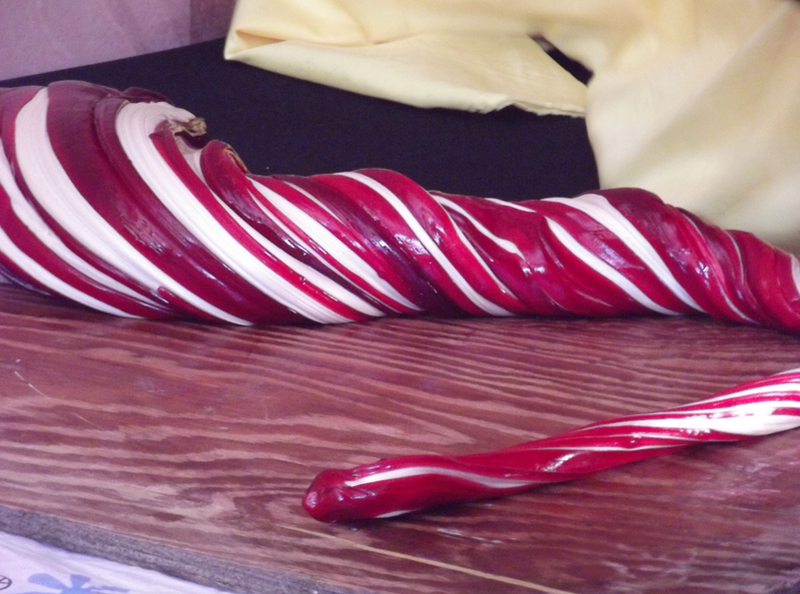 My excitement at seeing the Peppermint Candy Lady, as I started to call her, turned to pride. I had no idea that peppermint candy was ever made from scratch, let alone here in Jamaica. In a country that is often quick to embrace the new, I was thrilled to see someone who was carrying on the tradition.These are the kinds of experiences that, for me, make travel rewarding. I was to learn something else that night: peppermint candy making was an art that my paternal grandmother had practiced. I never knew my grandmother and as I watched the Peppermint Candy Lady, I imagined, for a moment, that I was watching her. After she finished and everyone had walked away, I approached. We didn’t get to talk long as Fay, that’s her name, had to set up her booth for the independence celebration that would begin the following day in Kingston. I wanted to watch her again and promised I’d meet her at the festival. I arrived just as she began setting up and we talked as I captured these photos of her at work. Fay Thomas, 52, learned to make peppermint candy by hand from her great grandmother. She was 13 or 14 when her great grandmother brought her into the business saying she was getting older and needed her learn and eventually take over. Back then, her grandmother used to turn 12 lbs. of sugar — boiled in two pots — into candy. Now, Fay does 6 lbs. and mostly displays her art at fairs and festivals. It’s a laborious process that she carries on for the love of it; it’s not enough for her to make a living at.